Antibiotics have saved millions of lives, mainly of people suffering from tuberculosis, meningitis and other illnesses, since the treatment was introduced more than a century ago. Today, unless strict action is taken to curb the overuse and misuse of antibiotics, we could be heading towards a situation where these previously “curable” diseases may become “uncurable”. In India, weak regulatory practices compound the problem, leading to complex challenges. Many upper respiratory tract infections, including colds, sore throats and even some ear infections, should not be treated with antibiotics, yet often still are. The unholy alliance between pharmaceutical companies and doctors resulting in over-prescription of antibiotics for ailments is very much evident. Another factor contributing to the problem is treating healthy animals with antibiotics to boost production, leading to resistance. And via the food chain, this spreads to humans. India does not have any mechanisms to check the use of growth hormones administered to cattle to increase milk production. Is our government listening? Apparently, yes. 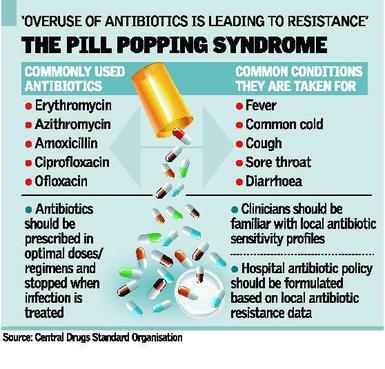 The Union health ministry in 2011 formalized a National policy for containment of antimicrobial resistance however, not much is known about the fate of the policy. One can only guess it to be similar to most other policies in our country which lack the tooth for effective implementation. We should therefore make informed decisions for treating common ailments before submitting ourselves to antibiotics prescribed by doctors. Because, we are the ones who glean the benefits or suffer the consequences. Sensitizing the public to this problem, in a way could motivate political commitment to implement an effective policy.